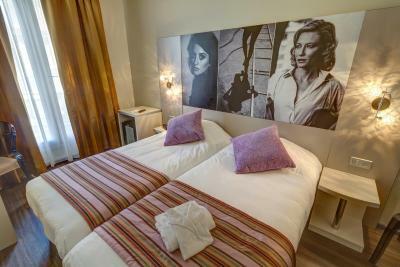 Lock in a great price for Hôtel Arles Plaza – rated 8.5 by recent guests! Free parking- great pool and lounge area so you’re not stuck in your room. Bed and shower was very comfortable. It’s a moderately easy walk to town, sites and restaurants. Ice machine! Free and safely private parking. Takes 10min to go to city center. The lady at the reception kindly advised us some places and restaurants. Breakfast was nice but the breads were not fantastic. Everything, even if the decor is quirky. Parking on site is bliss. Excellent breakfast, amazing location, easy parking, fun for families...pool, soccer, roof top deck, big room. Easy access from highway. Great location. Easy to reach by auto and a short walk to all of Arles. Staff were outstanding. Lovely breakfast. Wonderful for families. Our 12 and 15 year old boys enjoyed the pool and soccer area. Friendly staff; fun theme (movies); free parking on site; easy 10-15 min walk to town. The room was compact but was ok for a couple for one night. The bathroom was spacious with an excellent shower. The air conditioning was very efficient and the car park easy to access. The decor of the hotel was interesting and modern and there was a lift. The receptionist was friendly and spoke English. The breakfast was ok and included in the price. The location was ok as it was only about 15 mins walk into town. We had a lovely meal in the courtyard restaurant Le Jardin des Arts. "Friendly, informative, accommodating Reception Desk personnel" "Comfortable Bed, Good size Bathroom" "Only 10 minute walk to Tourist Information Center"
Very modern and clean hotel with great parking. Breakfast was amazing- lots of selection. Our room was huge - everything was immaculate. we did not use the pool but it looked inviting. 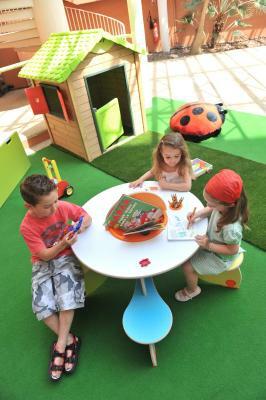 Looks like it is very children friendly with play areas. Easy walk to the sites. 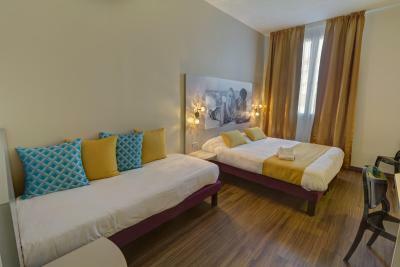 One of our top picks in Arles.Located in Arles, Hôtel Arles Plaza is a 15-minute walk from Arles Roman Amphitheater. It features a large heated indoor pool that is uncovered during warm weather, a covered garden and a playground. The air-conditioned rooms have flat-screen TV with satellite channels. Private bathrooms are equipped with a hairdryer and amenities. Breakfast can be delivered to guests’ rooms or selected from the buffet. Tables are provided in the glass-roofed terrace where guests can dine or use WiFi Internet for free. On site guests can use the fitness center. A billiards and ping pong table are also available. Electric bikes can be rented on site. A free car park is provided. Staff are available 24 hours to provide assistance for walking and wildlife trails in the Camargue, which is 7.5 mi from the hotel. 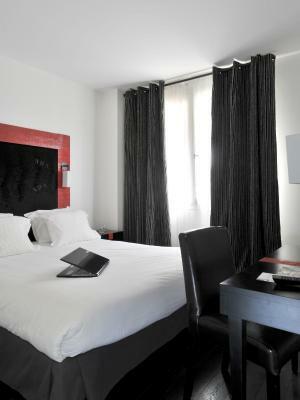 When would you like to stay at Hôtel Arles Plaza? 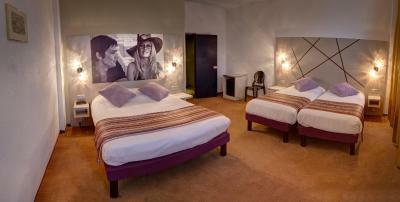 All rooms are air-conditioned and include an private bathroom with free toiletries. Extras in this room include a walk-in shower and a free bottle of mineral water on arrival. This single room has a soundproofing, satellite TV and electric kettle. 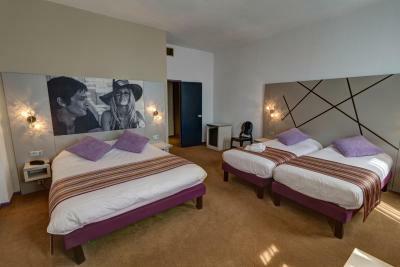 This twin room features air conditioning, soundproofing and electric kettle. This twin room has a soundproofing, flat-screen TV and bathrobe. This triple room features a satellite TV, soundproofing and bathrobe. This suite has a electric kettle, soundproofing and air conditioning. 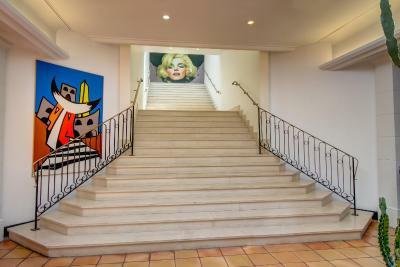 House Rules Hôtel Arles Plaza takes special requests – add in the next step! ANCV Chèques-Vacances Hôtel Arles Plaza accepts these cards and reserves the right to temporarily hold an amount prior to arrival. Hôtel Arles Plaza accepts these cards and reserves the right to temporarily hold an amount prior to arrival. A bit far from the center of The town, the room was clean and staff were helpful and nice, but just the room itself is not the type of style I like, no view at all, so overall I don’t think it’s a good value for money. Attic room with low beams. Noises throughout the night from vermin in the roof space. Excellent customer service from Heather. Great hotel location. Breakfast was really basic. The juice machine was broken. The location is at at a walking distance to the city center. Had to change hotel as they closed for the season half way through! Not impressed. No food served except to groups. My wife and I are seniors and had to walk quite far to find a restaurant. No taxis available. Hotel not I center. Would need cab service or restaurant service at hotel. Would not recommend this hotel. Wonderful hotel with movie themed entrance and spaces. Very clean, spacious rooms. Friendly staff. Rubbish breakfast service! We showed up a bit late, but that is no excuse for 80% of the stuff missing. Us and another couple had to ask for replacement of missing stuff. Ham, cheese and baguettes were then brought, but that was all. Big disappointment! Especially in France! 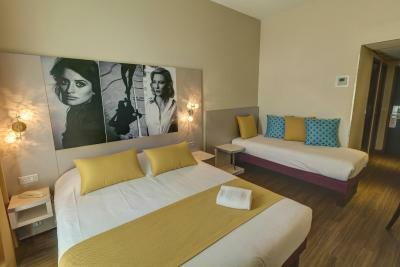 Nicely designed hotel in walking distance of Arles centre. The receptionist was very helpful with pointing us in correct direction and also providing us with tips for restaurants! Problemless parking at property! Unsecured WiFi!!! Our room was in the center so that people could potentially see in with drapes closed to their little courtyards..
We’ve stayed at the hotels better than this one with cheaper price. We got a room above a pool so we had to endure no view and presence of mosquitos(couldn’t really open the window). Quite a work (min 20 min) to city center. Clean, had a fridge, lots of towels. Our comfort double room was too small for a three night stay and lacked daylight and a full length mirror. We changed room after the first night and this one was much better. The interior of the hotel was colourful and interesting. The breakfast was good. There was a small pool which was always quiet and pleasant. There were plenty of easy parking spaces. Location was good for the old town. The hotel was clean and airy. The size of the room are very small (looks bigger in the pics, as many). The swimming pool it self was quite "smoky" the color of the water, so not that clear as a clean swimming pool should be. The hotel as a lot of potential but it's not expressing it! The parking is a plus. The easy connection with the highway. The lobby space. It is quite close to the city center, 8 minutes walking distance. The staff was kind, especially Sonia. Bit out of the city.